I just wanted to follow up on a post that I made about a week ago regarding the disrespectful manner the millionaire ingrates in the NFL (and locally the Detroit Lions along with their cowardly management) had adopted over the latest faux outrage during our National Anthem. Yes, there were a few interesting twists that I didn’t anticipate as well. First of, I got to give kudos to KG Two for pinch-hitting for me on this one and taking some pictures and getting some details so that I could write this. I got held up at a pickup and there was no way that I was going to make it back in town in time this morning. So, here’s the lowdown from Sunday Morning. After a few issues with counter-demonstrators setting up shop across from the original meeting location at Brush and Montcalm (right in the permit parking/season ticket holder parking lot where they set up shop…let THAT one sink in for a moment), everyone from the Pro-National Anthem group packed up and re-assembled again just south of the original location at Brush and Adams, right in the middle of Lions Pride Plaza. 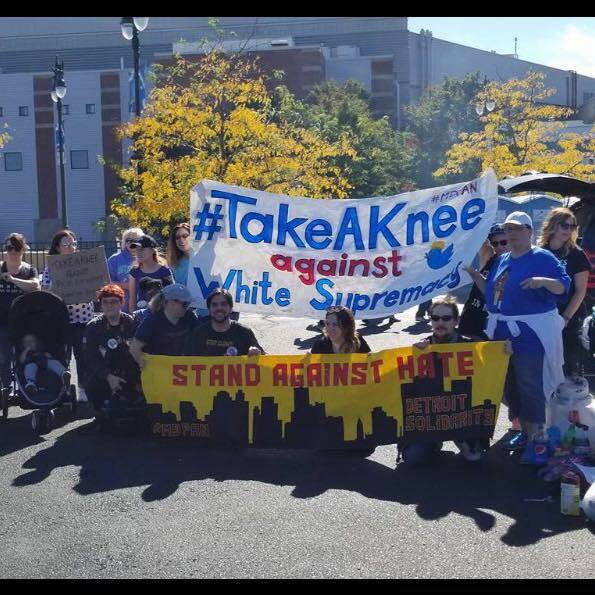 It was actually a pretty good sized group given the timeframe for organizing this event and the fact that there were no more “I Stand” signs left before the end of the protest should tell you something right there. 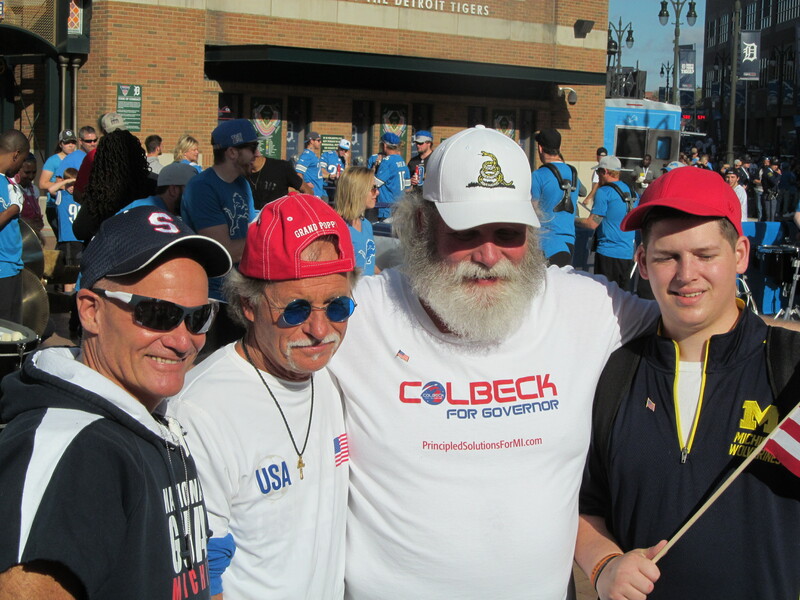 The first wave of attendees including Boycott NFL Detroit Organizer Brian Pannebecker along with “Your Defending Fathers” co-host “Trucker” Randy Bishop. I called to double-check on this fact when the Detroit News reported on this story this afternoon. The News pooch-screwed a number of facts about the protest (and NOT limited to just hilariously under-counting the attendees), since I was told that they not only arrived late to the event (other reporters had no difficulty arriving right before the protest began taking notes and pictures), but only covered just one of the intersections where people were protesting at downtown. MLive covered this story far more accurately, including the number attending. Anyways getting back on topic here, at the scheduled starting time everyone was introducing themselves to one another along with handing out signs and given general instructions about what to do for the day. No one anticipated very much trouble, considering that most of the fans were respective and support what they were there for. 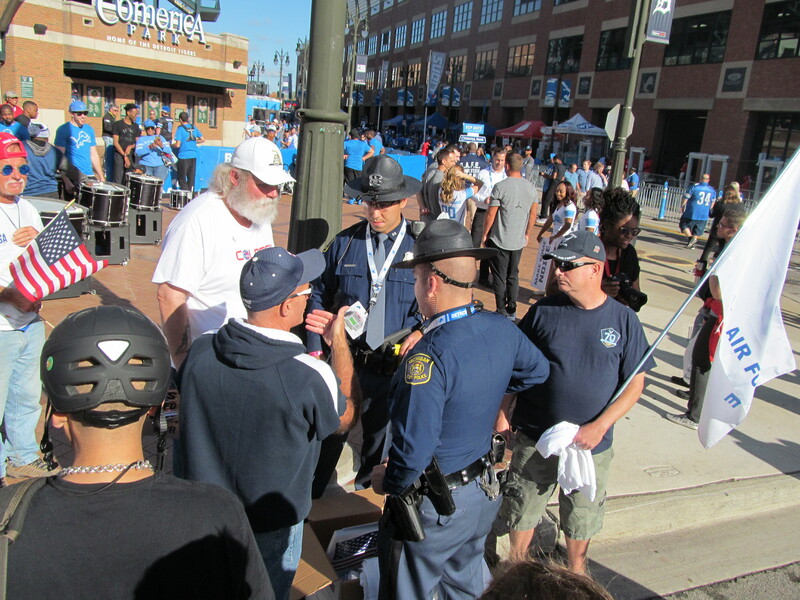 However, Ford Field security was not too happy that the group had set up camp right where most fans would walk on by while entering Ford Field and were keeping an eye on everyone. Then DPD started showing up. A few minutes after the protest had begun, several MSP Troopers walked up and told everyone that they had to leave the area. We really appreciate your support, guys. But the Ford Field people have claimed this public street corner as Ford Field Property and they want us to make you leave. Remember, they were set up on the corner of a city street. Some people were standing in the street (which was closed off to traffic). They were told that they had to move on because the area (a public street) was Ford Field property and that Ford Field Management didn’t want them there. At this point, nothing had happened involving anyone from the group. Nor had anyone had gotten into any arguments or altercations with counter-protestors. It was just a group of people supportive of our National Anthem engaging in a peaceful protest with signs and flags. A galling detail that was passed onto me later was the fact that the same wasn’t done for the counter-protestors in the permit parking lot at the original location, so that alone should tell you something right there. Detroit Antifa Chapter image shamelessly lifted from someone’s Facebook feed. This image was taken in the permit holder parking lot just north of Ford Field shortly after the game had begun. Note the noticeable lack of police or Ford Field security presence. Not wanting to get any media exposure for all the wrong reasons, they packed up and moved south again to the corner of Brush and Madison. The group had then broken up into smaller groups to stake out multiple intersections around Ford Field, politely asking fans to stand for our national anthem. 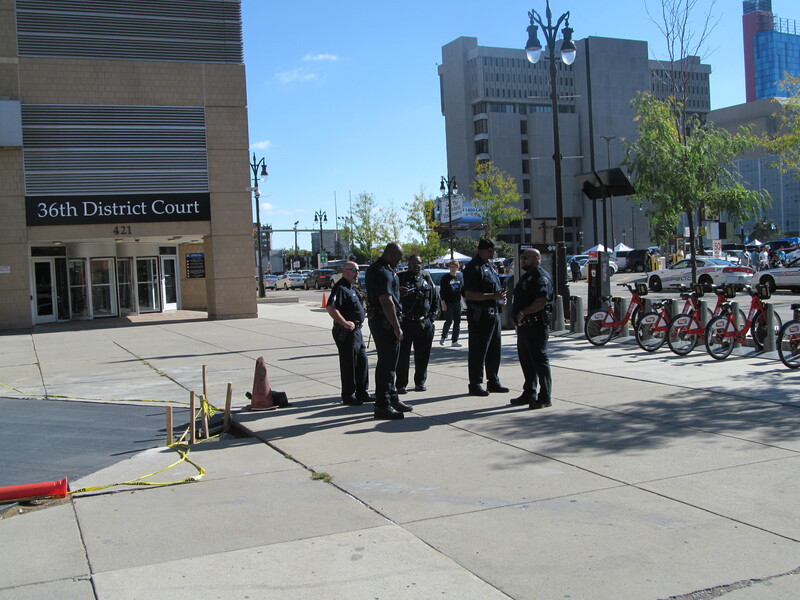 Here you see more DPD presence than most Detroit neighborhoods see in a year making sure that the people supporting our flag, our National Anthem and law enforcement don’t cause any trouble. Let that fact sink in. And I was told that there were at least six more officers (and one Deputy Chief) who arrived later to shadow Boycott NFL Detroit Protestors. Overall throughout the rest of the morning/early afternoon (I am told), people attending this afternoon’s game were supportive of the goal of the protest; standing for our National Anthem. Each of them easily reached several hundred fans. Multiply that by the overall number of people attending this protest and you’re talking a very significant percentage of the Lions Fans at Ford Field this morning. Disappointingly, The Lions (and what passes for management), are apparently taking a “Pay no attention” approach to the backlash against not standing for our National Anthem by not only removing protestors from a public street, but now they are scrubbing it out of their TV coverage entirely. There are two things I’d like to add to finish up this post. First, if the courage of these football players had actually matched their conviction, why kneel? Detroit Police Headquarters moved a few streets over on Third St. (along with a Michigan State Police Post), but it is still within walking distance of Ford Field. The Coleman A. Young Municipal Center (aka Detroit City Hall) is about the same distance on Woodward & Jefferson. 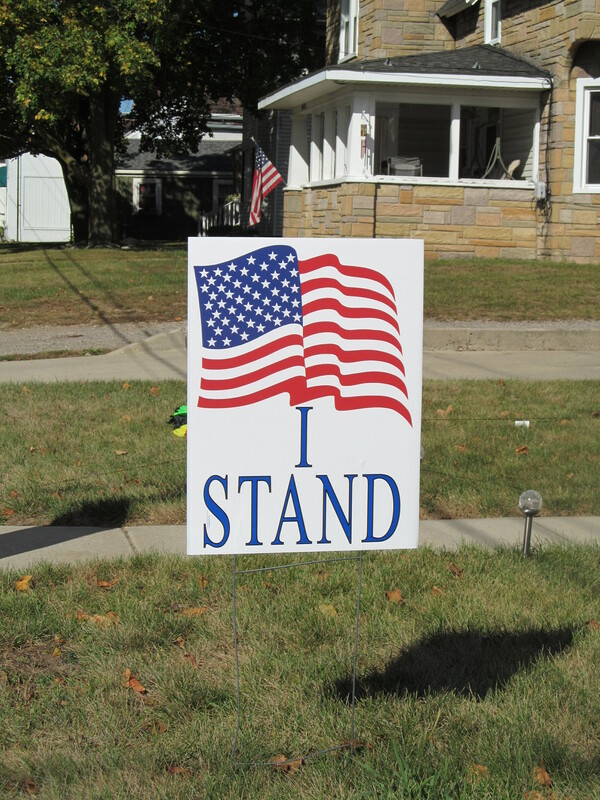 The Wayne County Board of Commissioners is over on Griswold…again a short walk away. When was the last time that anyone has seen a football player (or even Martha Ford herself) appear at just one of those locations to “protest“ the very same thing they are supposedly getting on their knees for? You haven’t and it’s a safe bet that you never will! A honestly cannot think of any better way to end this post, other than to thank all of those who had taken the time out of their busy schedules to come down to Detroit and support our National Anthem. ← Because GOP Voters Are THAT Stupid? Frankly, I wish I had the time to squander on a herd of semi-literate Colin Kaepernick wannabe fools in Detoilet. Folks like Marine veteran Rodney Heard, and many others, have the right idea- burn your tickets and go find something better to do with the time remaining in your life. My $$ laid that sidewalk that the arena assumes is their property. In fact, the whole arena is mine--I want my money back!!!! P.S. Thank you KG et al. P.S.S. enjoyed the pictures of my home town but it's not the way I remember it.